IPC Eagle CT110 Rider Scrubber - 28" w/Brushes | Kerr Paper & Supply, Inc.
Pre-programmed work setting. High quality/high performance vacuum motor. Great maneuverability due to optimum weight distribution. Large solution capacity. Extensive running time, large battery compartment. Brush control with delayed automatic stop. 3 solution distribution options (standard, automatic, economy). Exclusive squeegee system assures high performance at low cost. 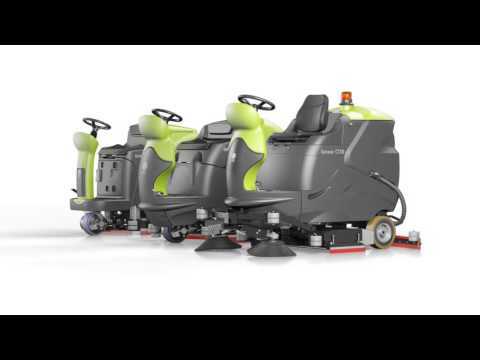 These scrubbers have SLS (Self Leveling System) automatic brush pressure control. External battery charger plug, on board charger can be easily installed now or later. Inlet and outlet filters for maximum solution tank protection. AFS (Anti Foam System). Easy access to internal compartments. Designed to assure minimum noise levels. Automatic stop (by command release) in working mode. Solution tank can be tilted. Squeegee blade can be used on 4 sides before replacement. Automatic squeegee lift in reverse. Squeegee assembly and blades replacement without tools. Solution Tank Capacity: 29 Gal. Recovery Tank Capacity: 32 Gal. Empty Weight Without Batteries: 471 lbs.